Who doesn’t love a good pizza? Unfortunately, really good pizza can be hard to find (especially in Las Vegas!) If you’re vegan the selection becomes even more sparse. But fans of pizza in the 89107 area can rejoice; there’s fresh, vegan pizza waiting for you at Pop Up Pizza! In addition to being one of the only pizza places in Las Vegas to offer vegan options, we also pride ourselves in crafting unique pizza creations you can’t get anywhere else. To make things easier, you can order online, by phone, or stop by in person. Plus, there’s always the option to create your own pizza from our selection of toppings, and you can enjoy a nice salad and a drink from our full drinks menu alongside your pizza! 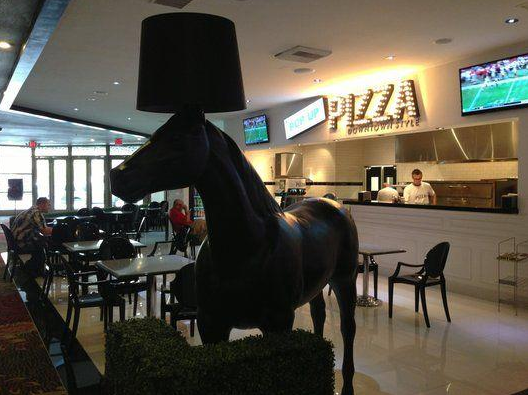 While you dine, you can also view original artwork by Japanese artist Takashi Murakami, or take a picture with our famous life sized horse lamp, Fremont Filly. Come visit us in the newly renovated Plaza Hotel in Downtown Las Vegas between 11 AM and 2 AM, and see for yourself why we’re the best pizza place in Las Vegas! Call us at (702) 366-0049 to order or get updates on current promotions and discounts. We look forward to seeing you!